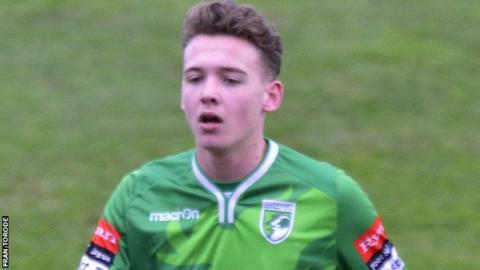 Boss Tony Vance praised the performance of teenager Robbie Legg in Guernsey FC's 4-3 Isthmian League Division One South defeat by Whyteleafe. Legg, 16, opened the scoring with his first goal for the Green Lions, but they suffered a sixth successive loss. "I thought the team needed Robbie Legg and Robbie Legg needs to be in the team," Vance told BBC Radio Guernsey. "I'm delighted for him, his movement's outstanding, and the players are trusting him. There's more to come." A Ross Allen penalty and Craig Young strike put the Channel Islanders 3-2 ahead but they went on to concede four goals for the third consecutive game. They remain 11th in the table, but are now seven points adrift of the play-offs with eight games remaining. "There were some crazy, ridiculous decisions but you've got to live with that," added Vance. "I asked the boys to go and be brave in possession and generally I felt they did that. "We got absolutely nothing, but what I did say is that we can go to training and be a little bit more buoyant than we deserved to be a few weeks back."